Using 15+ years of combined professional experience in real estate, consulting and management, I assist buyers and sellers of all demographics to accomplish THEIR goals - whether it be finding the perfect home with the schools and ward that fit their needs best, or selling their home for the highest price in the least amount of time. Attended Brigham Young University and graduated from San Jose State University with high honors. I have recently served as Folsom Stake Public Affairs Assistant Director where community service was a regular part of the calling. Spearheaded the El Dorado Hills Community Volunteer Day for years, served on school Site Council, C.A.S.A. (Court Appointed Special Advocates), Boy Scouts, El Dorado Food Bank, Loaves and Fishes, and many other programs over the years. I grew up in the San Francisco Bay Area (Menlo Park Stake) and was actively involved with sports and academics. I moved to Caracas Venezuela in high school where my father served as a Mission President. I served a summer mission there before going to BYU Provo. I met my husband there and we have raised five children in El Dorado Hills. I have worked as a consultant in a corporate environment and have had years of pharmaceutical sales experience. 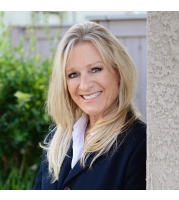 The combination of this experience along with my expertise of the Greater Sacramento Area and managing my children's lives around schooling, sports, music and other activities have made me a great resource for helping people with their Real Estate goals. I currently play women's soccer and snowboard with my husband Brad. Our youngest child recently graduated from high school in the Spring of '18 and will be serving a mission in Mexico. I currently teach Relief Society and stay busy with my full time business in Real Estate. Finding and/or selling a home can be a very stressful process. My job is to communicate through the whole process and have a high level of competency so that my clients feel that they are in good hands and are optimizing financial considerations. My number one goal is to have their trust and confidence so that ultimately they look back having had a great experience through the buying and/or selling process. My reviews (Zillow, etc.) speak to this accomplishment.